Based on our regular economic and monetary analyses, we decided to keep the key ECB interest rates unchanged. We continue to expect them to remain at present or lower levels for an extended period of time, and well past the horizon of our net asset purchases. Regarding non-standard monetary policy measures, we confirm that we will continue to make purchases under the asset purchase programme (APP) at the current monthly pace of €80 billion until the end of this month and that, from April 2017, our net asset purchases are intended to continue at a monthly pace of €60 billion until the end of December 2017, or beyond, if necessary, and in any case until the Governing Council sees a sustained adjustment in the path of inflation consistent with its inflation aim. The net purchases will be made alongside reinvestments of the principal payments from maturing securities purchased under the APP. Let me now explain our assessment in greater detail, starting with the economic analysis. Euro area real GDP increased by 0.4%, quarter on quarter, in the fourth quarter of 2016, following a similar pace of growth in the third quarter. Incoming data, notably survey results, increase our confidence that the ongoing economic expansion will continue to firm and broaden. The pass-through of our monetary policy measures is supporting domestic demand and facilitates the ongoing deleveraging process. The recovery in investment continues to be promoted by very favourable financing conditions and improvements in corporate profitability. Moreover, rising employment, which is also benefiting from past structural reforms, is having a positive impact on households’ real disposable income, thereby providing support for private consumption. Also, there are signs of a somewhat stronger global recovery and increasing global trade. However, economic growth in the euro area is expected to be dampened by a sluggish pace of implementation of structural reforms and remaining balance sheet adjustment needs in a number of sectors. This assessment is broadly reflected in the March 2017 ECB staff macroeconomic projections for the euro area, which foresee annual real GDP increasing by 1.8% in 2017, by 1.7% in 2018 and by 1.6% in 2019. Compared with the December 2016 Eurosystem staff macroeconomic projections, the outlook for real GDP growth has been revised upwards slightly in 2017 and 2018. The risks surrounding the euro area growth outlook have become less pronounced, but remain tilted to the downside and relate predominantly to global factors. According to Eurostat’s flash estimate, euro area annual HICP inflation increased further to 2.0% in February, up from 1.8% in January 2017 and 1.1% in December 2016. This reflected mainly a strong increase in annual energy and unprocessed food price inflation, with no signs yet of a convincing upward trend in underlying inflation. Headline inflation is likely to remain at levels close to 2% in the coming months, largely reflecting movements in the annual rate of change of energy prices. Measures of underlying inflation, however, have remained low and are expected to rise only gradually over the medium term, supported by our monetary policy measures, the expected continuing economic recovery and the corresponding gradual absorption of slack. This pattern is also reflected in the March 2017 ECB staff macroeconomic projections for the euro area, which foresee annual HICP inflation at 1.7% in 2017, 1.6% in 2018 and 1.7% in 2019. By comparison with the December 2016 Eurosystem staff macroeconomic projections, the outlook for headline HICP inflation has been revised upwards significantly for 2017 and slightly for 2018, while remaining unchanged for 2019. The staff projections are conditional on the full implementation of all our monetary policy measures. Turning to the monetary analysis, broad money (M3) continues to expand at a robust pace, with an annual rate of growth of 4.9% in January 2017, after 5.0% in December 2016. As in previous months, annual growth in M3 was mainly supported by its most liquid components, with the narrow monetary aggregate M1 expanding at an annual rate of 8.4% in January 2017, after 8.8% in December 2016. Loan dynamics followed the path of gradual recovery observed since the beginning of 2014. The annual growth rate of loans to non-financial corporations was 2.3% in January 2017, as in the previous month. The annual growth rate of loans to households was 2.2% in January 2017, after 2.0% in December 2016. Although developments in bank credit continue to reflect the lagged relationship with the business cycle, credit risk and the ongoing adjustment of financial and non-financial sector balance sheets, the monetary policy measures put in place since June 2014 are significantly supporting borrowing conditions for firms and households and thereby credit flows across the euro area. In order to reap the full benefits from our monetary policy measures, other policy areas must contribute much more decisively to strengthening economic growth. The implementation of structural reforms needs to be substantially stepped up to increase resilience, reduce structural unemployment and boost potential output growth. Against the background of overall limited implementation of country-specific recommendations in 2016, greater reform effort is necessary in all euro area countries in 2017. Regarding fiscal policies, all countries should intensify efforts towards achieving a more growth-friendly composition of public finances. A full and consistent implementation of the Stability and Growth Pact and of the macroeconomic imbalances procedure over time and across countries remains crucial to ensure confidence in the EU’s governance framework. Question: In January you outlined four criteria to describe the sustained adjustment part of inflation. Could you give us a progress report, how far you feel you are in fulfilling each one of those? There has also been a debate about introducing a small change to the forward guidance and it is removing the clause that says that you are still ready to lower rates if needed. If I am not mistaken, this clause is still in place. So could you explain to us why and if there has been a debate on this passage? Draghi: Well, let me give you the substance of the discussion we had at this Governing Council and in so doing, I will also answer your points. It's actually been built, if one was to summarise, on three blocks. The first one is the acknowledgement of success; namely our monetary policy has been successful. Let me give you just a few numbers of why we say that and how we measure the success. Since 2015 real GDP growth has been steady at between 0.3 and 0.6% quarter-on-quarter. The Economic Sentiment Index in February this year is the highest since 2011. The PMI composite output index, again this February 2017, is the highest since April 2011. The unemployment rate in January was 9.6%; it's the lowest since May 2009. Employment-wise, well, I said last time that in the last three years, four million jobs have been created. Now, in fact it's more than four million jobs because there's been a recent revision in the number of employment figures in Germany, so it's even more than four million. By the way, incidentally, in just giving you these numbers about employment, let me add, those who had doubts about the equity of our asset purchase programme are being answered because the most equitable measure of all is to create employment and to decrease unemployment. The recovery broadened further in the last quarter last year across sectors and across countries. The interesting thing which is continuing – I think I remarked about that last time – is that the dispersion of value-added growth across countries reached an all-time low. In other words, countries seemed to grow more together; an all-time low since 1997. If we move to inflation, I would say that risks of deflation have largely disappeared. Market-based inflation expectations have increased noticeably. Also those are longer-term horizons even though they are still below the level that is considered to be adequate for pronouncing victory on the inflation front. The financing conditions and credit demand have continued to improve. Lending rates for households and companies have declined significantly by more than our key interest rates. The cross-country heterogeneity – you remember the time when we had fragmentation – we had countries where our lower interest rates were not passed on to or through lower lending rates. Now this heterogeneity has materially decreased. For example loan rates in Italy and Spain have declined more than in Germany and France. The borrowing conditions for SMEs have improved and the firms' demand for loans has increased considerably. Also very important, the NFCs’ – the non-financial companies' – leverage has gone down quite significantly. Finally, let me give you a final estimate of the impact of our monetary policy measures. In the three years between 2016 and 2019, the accumulated impact of our policy measures is 1.7percentage points on inflation and 1.7 percentage points on growth. So that's basically the assessment that inspired the interventions of the Governing Council members; namely acknowledged the success of our policy. The second block was the one that you just heard me saying in the introductory statement; namely the appropriateness of the present monetary policy stance upon which these projections are based. So based on current information, the monetary policy stance that I have just read in the introductory statement is considered appropriate by the Governing Council. The third block was a discussion about risks, about the economic situation, how it has evolved. Again there was a general recognition that the balance of risk has improved certainly as far as growth is concerned. So following from this, it's quite clear that the assessment of certain scenarios that were considered very likely before is now telling us that these scenarios are going to become less likely. That had some consequences in our language; namely there was a sentence which has been removed from my introductory statement that used to say, “If warranted, to achieve its objective the Governing Council will act by using all the instruments available within its mandate”. You remember from the previous introductory statement. That's been removed, basically, to signal that there is no longer that sense of urgency in taking further actions while maintaining the accommodative monetary policy stance including the forward guidance. But that urgency that was prompted by the risks of deflation isn't there; that was the judgement, the assessment of the Governing Council. The second issue on which I would like to draw your attention is, as you know, the TLTROs are going to expire. There was no discussion about having another TLTRO, not at all. Then we had – not an intense – but just a cursory discussion about whether to remove the word 'lower' from the forward guidance. Now, also before I get to that, let me tell you what I said in this press conference in March 2016. I said from today's perspective, and taking into account the support of our measures to growth and inflation, we don't anticipate that it will be necessary to reduce rates further. Of course new facts can change the situation and the outlook. Since then, we frankly never discussed this. So we had an exchange on that. Now, I'm saying this just to emphasise it's not a dramatic choice whether to keep or to remove it. But in the end, the Governing Council, given the fact that we can't yet say that we are there with a self-sustained inflation rate, preferred to keep this option in the language. So we will continue to look through changes in HICP inflation to the extent that they are transient and without implication for medium-term outlook for price stability. Question: Two questions, if I may; one a follow up on the TLTRO you mentioned. You said there was no discussion about the new TLTRO. Can you elaborate a little bit more on this because there was so much noise about it before this meeting that there could be new one? Is this tool now completely off the table? Or is it just you put it at the back and see what's going on and perhaps in the next few months it could happen? Or if you'll start tapering or exiting from the QE, it could be a good option to safeguard liquidity in the future. The second question, a little bit broader, if I may. If you look at the CDS markets, the spreads are rising again. So that tells me and more and more market participants, the markets start betting again on a potential break-up of the eurozone, how do you want to deal with that situation especially given the fact that we have many, many important political aspects on the way forward this year? Draghi: Now, on the first question, I only remarked it was not discussed at all as a sign of the improved climate, so no member of the Governing Council felt the need to even mention this. Having said that, very much in the spirit of our forward guidance, it's there and it's potentially an instrument that could be used if the economic situation will warrant that. In other words, there is no ideological or institutional or legal obstacle to that. On the second point, well, frankly I don't see that; there are tensions but not anything that is that serious. In any event, I've said it on and on; we are ready, the euro is irrevocable. And more than my words – we can discuss it further if you want – but the commitment first of all should be the experience we had by the euro. Incidentally, in the last full Eurobarometer more than 70% of the people in the euro area are in favour of maintaining the euro and this percentage is increasing. In the midst of the crisis, three countries joined the euro. The euro is being perceived as being the prerequisite of the single market. If there is no single market, there is no European Union. Countries, no matter what their views are, have greatly benefited from the single market. So all this speaks in favour – and especially also after the experience of 2012 – of looking at these developments with great attention, but no anxiety. Question: You've noted a lot of reasons why to be upbeat and yet my impression is that you're not convinced. So what would we need to see before you'd have the sort of high-class problem in which you would be willing to drop the commitment to further easing? Is it a case that we'd need to see a more neutral balance of risks? Or should we be looking more specifically at the four criteria you've listed for inflation? My second question, there seems to be a lot of speculation out there that you could raise rates before the end of QE, which clearly contradicts your opening statement and yet the speculation seems to persist. So would it be possible for you to clarify whether you can see any circumstances under which you would raise rates before ending bond buying? 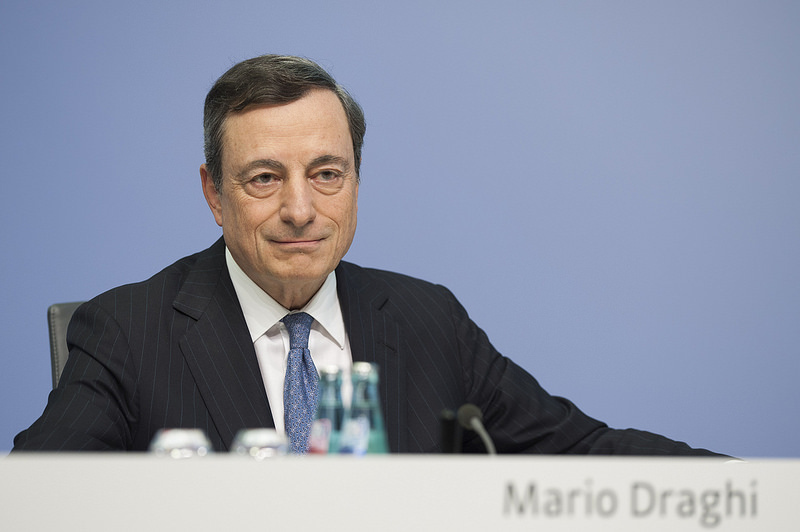 Draghi: No, I simply reported on the discussion; it's not a matter of being convinced or not. One thing that one has to understand is that this is a gradual process. The Governing Council members want to be convinced that they actually see a self-sustained adjustment in inflation rate. We don't see it yet. I said it in the introductory statement; there are no convincing signs. Where is it? Here, yes, “This reflected mainly this higher headline inflation, strong increase in annual energy and unprocessed food price inflation, with no signs yet of convincing upward trend in underlying inflation”. So at the same time, the projections are conditional on the full implementation of the monetary policy measures that I have just read out. It's a gradual process. I was saying we have acknowledged the progress on the growth front, on the recovery front. We are pretty confident that, as this will proceed, this slack will close, the labour market conditions will improve. We'll start seeing that wage growth, which is the lynchpin of a self-sustained increase in inflation. That is the key variable that we should look at; it's not the only one but it's certainly key. So it's not that one is convinced or unconvinced all of a sudden. We are progressing towards that objective. We are confident that we are progressing and we see we can actually assess the success of our decisions through the numbers that I have just given you on growth, on employment, on credit markets, on financing, on inflation expectations. Now, on the other point, I don't want to speculate. The forward guidance now is this one and based on current information that's what it is. It says that, “Until the Governing Council sees a sustained adjustment in inflation, net asset purchases will continue at a monthly pace of €60 billion, until December 2017 or beyond if necessary. The interest rates” – where is it – yes, in the beginning it says, “Based on our regular economic and monetary analysis we've decided to keep the key ECB rates unchanged. We continue to expect them to remain at present or lower levels for an extended period of time”. So I remark here, it's an expectation; we expect them to remain at present or lower levels. Now, as I said, the probability of an expectation that will actually materialise into lower level has gone down, given what I just said about the rest, about the progress we've made. But the forward guidance, the Governing Council has decided to keep this forward guidance exactly as it stood before. Question: I had a question about the level of agreement within the Governing Council. Would you say that there's more consensus today going outwards or continuing with the stimulus than there was a couple of years ago when you were going into the QE programme, because some Governing Council members have expressed doubts about whether the current level of stimulus is too strong? My second question is on trade surpluses. The new US administration has expressed concern about surpluses in Germany. There's also a large surplus for the eurozone as a whole. Do you think there's any merit in such criticism? Do you think Germany and the eurozone trade surplus reflects some kind of imbalance that could have a negative effect globally or for the eurozone? Draghi: Let me respond to the second question first. I don't think there is any merit in attacking Germany. First let me say that by the way, I have discussed this; I've answered the same question in European Parliament. When was that? Two, three weeks ago. The currency of Germany is the euro and the euro area’s monetary policy is conducted by the ECB. 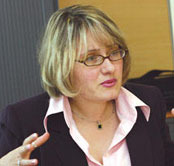 The ECB is independent as laid down in the European treaties and in the Statute. The exchange rate of the euro is determined by market forces, which is consistent with the long-standing commitment of the international community to market-determined exchange rates as reiterated both at the G7 and at G20. In its latest report to Congress released on October 14, 2016, the US Treasury itself stressed that Germany does not manipulate the currency. Let me give you the quotes, “The Treasury has found in his report that no economy satisfied the criteria, including Germany, for being called a currency manipulator”. Second quote, “Germany has both a significant bilateral trade surplus with the United States and a current account surplus well above the material threshold”. But the European Central Bank has not intervened in foreign currency since 2011. When we did it, we did it as part of a concerted intervention in order to stabilise the yen following Japan's earthquake and the tsunami. So that is, I think, the answer to your point. I can continue. By the way, if we look at where the [real] effective exchange rate stands today with respect to historical average, we don't see especially that the euro is off the historical average. But the [real] effective exchange rate of the dollar is off the historical average. So it means that it's not the euro, which is the culprit for this situation. Now, in your first question you're asking me how the consensus changes from time to time and meeting to meeting; I actually don't have a meter to measure that. I would say the discussion today was pretty consensual. Each position was stated. By and large, I think I gave you a fair account of what was discussed. Nuances might have been different but I don't think – and in any event, I am not able to compare the degree of consensus today with the degree of consensus last time. But you asked me an even more difficult question; you're asking me to remember what the consensus was two years or three years ago. The bar is too high for me. Question: It's a dual question, really. Firstly, the calls from European leaders; how would the ECB handle a multi-speed Europe, as we've heard from Hollande and Chancellor Merkel of late? Secondly, just the trade-off between the deposit rate and the capital keys. We've seen some distortions specifically in the Germany market and for the last three weeks at the short end. I just wondered how the ECB would react to that. Draghi: Well, on the first point I really don't have much to say; it's an entirely wholly political judgement here. There is clearly the need to work more together because the nature of the problems that have presented to the European countries are – all of them, I would say – supranational problems. So they can be successfully coped with only together. Now, given that the political situations in different countries are different, it may well happen that countries are not equally ready to move together towards working together. So I guess that's where the reference to a multi-speed Europe comes from. The acknowledgement that certain groups of countries, either because they perceive that their problems are closer to their own entity or because they are more willing to work together, are readier than others to do this. So my understanding of this is that whatever arrangement could be found, it is not clear yet which specific area would be addressed by this arrangement. But whatever arrangement could be found is going to be an open arrangement; namely ready to welcome any other country that would like to join. But I don't know enough about the specificities of this statement to elaborate more than that; perhaps I will know more tonight. The other point is about the distortions in the German market. Yes, we've observed and we are monitoring them quite closely. We asked ourselves, what could be the reasons, the causes for these interest rate movements? We are in a quite preliminary stage of our analysis so what I'm going to tell today is just very provisional. There are several causes; one is that certainly the German short-term bonds, more generally all the German bond market is viewed as a safe haven. So there have been flows towards this market and there has been what we call a flight-to-quality phenomenon as well. But if we limit our attention to the short-term segment, on top of that we see that the German short-term bonds are equivalent to putting money in the deposit facility. So the share of those who don't have access to the deposit facility invest into German bonds, short-term bonds. This share of people has gone up. That's why we have low yields in the cash bond market on the short term, but not in the repo market because investors are different. The other cause, of course, is our purchase programme, but to assess the relative weight, it's still too early. The first two causes seem to be pretty relevant, pretty significant – perhaps more significant than our asset purchase programme. But perhaps we want to come back on this next time to have a definite view on that. Question: I have two questions. One question is about economic outlook. Growth and inflation both are revised upwards today. What was today's risk assessment about the fragile transatlantic relationship or the coming elections in the eurozone? The second question is again about the currency manipulations discussion. Because the G20 meeting will be held next week in Baden-Baden in Germany, what kind of discussion are you expecting? Are you expecting any changes of G20 commitments or consensus in terms of exchange rate or banking regulations? 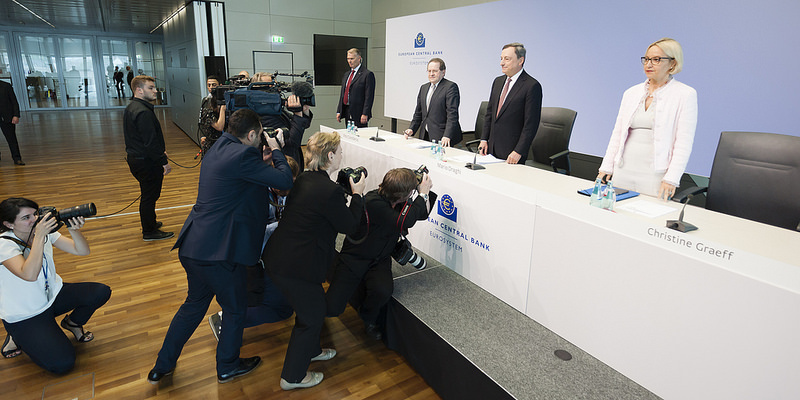 Draghi: In our introductory statement there is a reference to geopolitical risk or geo-global risk. But I am saying this because that's certainly a relevant risk source that we have taken into account in our discussion. If one wants to assess the balance of risk as it has been evolving over say the five, six months we would say that the domestic sources of risk have been more contained. The importance of domestic risk has decreased and the geopolitical global risk share of importance, if anything, has gone up. That is a fair assessment – although we've got to be very, very careful about this assessment because our experience of the last year and a half has been that we were expecting some significant economic impact from the various risks that have been materialising. You remember the Brexit, you remember the Italian referendum, you remember the new US administration. Now we have the elections in Europe. Now, these risks, some of them have materialised but we haven't seen yet a significant economic impact. So we are all asking ourselves – there are certain risks that are unambiguously negative. We know that certain of these events – and I don't want to point out which one – will produce in the medium term a negative consequence. But so far, almost a year and a half has passed from the British referendum – perhaps I am not sure I'm right – but about eight months, nine months, yes and we haven't seen yet a consequence. So we know that these are risky events. We don't know yet how these risky events will reverberate on the economic situation. On the second question, well, I think it's important to reiterate the commitments that were undertaken by our leaders and by our finance ministers. Let me just read; the last one was on July 24, 2016 by the G20 finance ministers and central bank governors in Chengdu, “We reiterate that excessive volatility and disorderly movements in exchange rates can have adverse implications for economic and financial stability. We will consult closely on exchange markets. We reaffirm our previous exchange rate commitments including that we will refrain from competitive devaluations and we will not target our exchange rates for competitive purposes”. Now, a statement like this – or statements to this extent – have been the pillar of the stability that has accompanied world growth in the last 20 years and longer. So it's very important that these commitments or commitments of this type are being reaffirmed. Question: Can I ask, has the Governing Council today discussed an exit from the QE programme? In line with that, has the Governing Council discussed the language in the statement saying, “We stand ready to increase our asset purchase programme in terms of size and/or duration”? Draghi: No, we haven't discussed either point. But by and large, if I can repeat what I said before, the original formulation of the forward guidance maintained a certain amount of flexibility just in case certain very negative scenarios were to materialise. From today's perspective, based on the information we have today, these scenarios have become more unlikely to materialise. Question: There was some discussion of the political situation a few minutes ago; I wonder if I could come back to that. There are a number of elections coming up this year. In most of the countries there is a candidate who is anti-euro or eurosceptic. It sounded a minute ago like you were pretty relaxed about that; am I reading you right? Or is this something that you're worried about and does it play any role in your discussions? Secondly, on the G20 I just wonder – am I correct – this will be your first meeting with any members of the new US administration? I'm just wondering if you have any agenda or message for them. Draghi: No, you are correct and, no, not really. Our mandate is relatively narrow if compared to the broadness of the issues that are going to be discussed by the finance ministers. We operate, we work and we craft our international position based on pursuing our mandate of price stability. So even in international fora we look at what conditions internationally are supportive of price stability. So I don't have any message at this point in time. I am certainly confident the discussion will be fruitful. Now, on your first point let me be clear; if we go back to when the euro was created there have always been people who said, oh, it's wrong, it's a mistake, cannot be done. They still were saying the same during the life of the euro and they are saying the same today. Now, I find this position – and that will tell you in which way I am concerned. In other words, not so much by the market developments, which I said before we look at and monitor with attention but without anxiety. But in a different way the euro, I was saying before, has been the cornerstone, the pillar upon which the single market could survive and could prosper and could increase prosperity of the member countries. So without a single market, there is no European Union so that's why it's unrealistic to think anything different from the euro. Especially now that all European countries face geopolitical challenges – terrorism, migration, security challenges – the euro is a channel for solidarity across some of its members. The leaders have expressed their clear intention to work together. I recalled before even in the midst of a crisis three countries – Estonia, Latvia, Lithuania – joined the euro. That was of course because of the direct benefits that such membership could bring, but also because of a sense of solidarity that such a membership would entail. So to cut it short, the euro is here to stay. So the question is not so much if it's irrevocable – it is. But then a more productive line of thinking would be, how do we make sure that we can increase prosperity, make it function better, this monetary union? In the course of its history you can see that many things have been done. Now, always in facing critical moments we tend to underplay our achievements in the past. But in fact if you look at the Stability and Growth Pact, if you look at the SSM, if you look at the ESM, if you look at the extraordinary shows of solidarity that countries have shown towards members that were crossing – were being in a state of crisis. On the other side you can also recall the extraordinary efforts of the countries that were in a programme. So all this tells us that the commitment of the European and euro member countries' leaders to the euro is very, very strong. So we should ask ourselves, what can we do better to make the euro more resilient, stronger in facing a crisis? Of course you know the way the ECB thinks about that, but there are many other routes. I think that today more than ever the situation is open to further progress. It's quite clear it has to be made more resilient; I think everybody would agree with that. Question: I've got two questions. You pointed out yourself earlier that the central bank has quite a narrow mandate. But it seems to me that the statement to say that the euro is irrevocable is quite a political statement. Or do you consider it as part of your mandate to keep the currency union or the euro alive? That's one question. My second question is, it sounded like you're more optimistic on the economic outlook and I wonder why that is not reflected in your inflation forecast for 2019. Draghi: Responding to the second question, we are – as you say, to use your words – more optimistic about the growth forecast. We have to see how these improved prospects as far as growth is concerned and the recovery and strengthening and broadening of the recovery, as I've said before, translate into higher headline inflation, into an inflation that satisfies the four features that were mentioned at the beginning: namely convergence to our objective of an inflation rate which is close but below 2%; that is a durable convergence, namely in the medium term so not transient; that is self-sustained, in other words a convergence that can stay there without this extraordinary monetary accommodation that's in place; and of course an inflation rate that meets the objective for all countries and not for one country only. So we haven't seen yet how these better prospects have translated and the reason why we haven't seen I've mentioned it before. It's that we haven't seen yet any significant development on the wages front; that is the key point. I think as I said, it's not the only point but it's one important element of our assessment. Now, on the other point, as you may imagine this question was asked at the time of the OMT, at the time of the London speech in 2012. No, the mandate of the ECB stays what it is; namely pursue price stability and make sure the conditions in which our work to pursue price stability is going to be successful, not more than that. Question: May I bring you back to the G20? How important is that for you that there will be a bold statement against protectionist measures, because there are reports that this might actually be dropped from the communique? Also the point which you made earlier; there might be a dropping of the point of the competitive devaluation point in the communique. How important is that to you that we are going to see that for the world community? Another question is a bit more technical. There are also concerns that already by now there are not enough bonds to buy for small countries like Portugal, for example. How are you going to address that problem going forward during the course of this year, given we keep on having the asset purchase programme around at the current speed? Draghi: Well, answering your second question, our bond purchase programme is on track both time-wise and quantity-wise. So we have no reason to be worried about this at this point in time. Now, on the other point, well, it's actually quite important. I was commenting before on the commitments that were concerning the exchange rates. I think I can say the same about the commitments on keeping an open trade. They have been the pillars of world prosperity for many, many years, many decades and so it's quite important that G20 reaffirms this commitment. Frankly, I don't know about these rumours. I know of the rumours but I don't know what to say about that, where they come from, whether it's true or not.